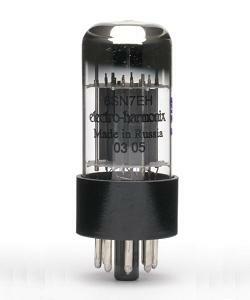 Electro-Harmonix tubes represent the finest audiophile and musical amplification tubes available today. Built to exacting specification, with an eye on the best aspects of vintage tubes, the highest quality materials and manufacturing tolerances are maintained. Electro-Harmonix also has the best tube matching equipment in the world. Their own designed machinery insures superior matching as well as the best balanced tonal response of any tubes on the market. Sweet, musical tubes for the professional.